Who is Dr. Michael Likey? Dr. Michael Likey, Dip.H. (Diploma of Clinical Hypnotherapy from The Robert Shields College of Hypnotherapy, England and also certified as a Fear Elimination Therapist, 2004) is also a double-Doctoral graduate (with a D.D., or Doctor of Divinity and a Ph.D. in Mystical Research) of the oldest and most respected University of Metaphysics in the world, Dr. Leon Masters' University of Metaphysics, located in Sedona Arizona, and the University of Sedona. He is the author of the popular and globally-available books "Magic Happens! and Journey of the Mind, Journey of the Soul, and also Founder/CEO/Spiritual-Director of his Sunday-morning spiritual gatherings/programs. He is a Member of the American Metaphysical Doctors Association, Member of the Association of Ethical and Professional Hypnotherapists (England), Member of the International Metaphysical Ministry, Associate-Member of the Canadian International Metaphysical Ministry. ONE-ON-ONE IF YOU PREFER, through his private practice, Dr. Likey will show you how you can create shifts in your life towards a healthier, happier, truly more loving, quality of life. His sessions are individually tailored to the specific needs of the patient/client, and could include but are not limited to: hypnotherapy, meditational mind-treatments, intuitive counselling, spiritual mind-science and psychology, Fear Elimination Therapy, and/or stress relief via Reiki/Pranic Healing. Inquire here on specific treatments and availability/fee-schedule. AS A KEYNOTE SPEAKER FOR YOUR SPECIAL EVENT, you can be sure that when you invite Dr. Michael to your event as a guest speaker/lecturer, or for a day workshop, you are guaranteed a successful, enjoyable event. 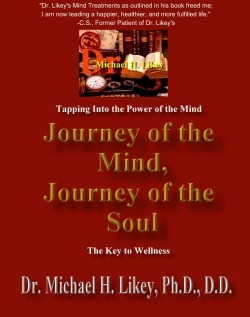 Dr. Likey presents inspiring self-help lectures that are empowering and thought-provoking. Combining mystism, psychology, theology, philosophy and other "isms", Rev. Dr. Michael Likey's live group presentations are always uplifting and provide a feeling of joy and wellness. Bringing thirty-years of research and practical experience to the table, you will always come away with useful tools for moving and growing forward in all areas of your life. There are also often CD's, books, and DVD's available after each event, not only as treasured and inspirational keepsakes of your experience with Dr. Likey, but also as practical tools you will use for the rest of your life. Also providing notes, affirmation-sheets and/or workbooks pertaining to the particular subject/topic being presented, Dr. Michael will be the highlight of your event. Inquire HERE about his schedule, fees and availability. Dr. Likey is also available to speak at schools, colleges, universities, and corporations on self-motivation, achievement, and holistic well-being. He is a Clinical Hypnotherapist, Doctor of Metaphysical Science, and Alternative-Wellness Practitioner. He earned his two doctoral titles with the University of Metaphysics and the University of Sedona. He is also a graduate of, and was certified as a Fear Elimination Technique Practitioner by the Robert Shields College of Hypnotherapy, England. He is the author of numerous self-help books including "Magic Happens!" and "Journey of the Mind, Journey of the Soul", available globally. A member of the American Metaphysical Doctors Association and the Association of Ethical and Professional Hypnotherapists, Dr. Likey has appeared on television in the 1990's for nine years and toured throughout North America, appearing at thousands of corporate events, schools, and universities. His books, along with his lectures and workshops (which always include workbooks) encourage self-empowerment and achievement, regardless of obstacles. "Believe in yourself, and miracles begin to happen." Dr. Likey will teach you how.